← My mother’s ‘flying saucer’ sighting in 1975……Do I believe her?……Yes, without any doubt!! The whole desert was already mapped off into sectors. It still is. They built the base in the piece of land which was named Area 51 and that is how it got its name. It was always called Area 51. But Stanton Friedman says it is an original document, not fraudulent thus creating an enigmatic piece to the puzzle. 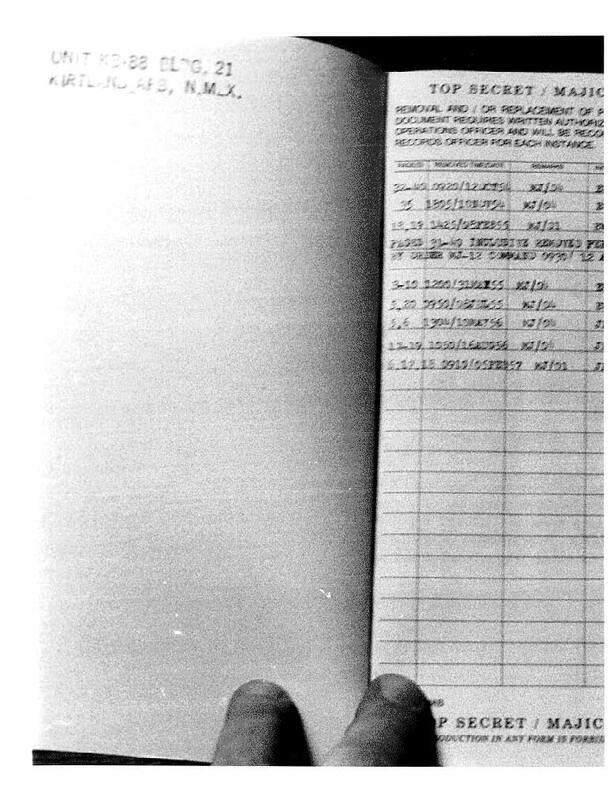 How can an original document from the US National Archives mention a section within the Nellis Air Force Gunnery and Bombing Range that did not exist for another year from the time of the document? Is it possible that someone within the military/government planning circle had already created numerical designations for the yet-to-be named areas? For instance, so although the area designated for project AQUATONE was not officially named “Paradise Ranch”, could it be possible that the numerical designations were already proposed and in place? I think that it is plausible. Anyhow, great post Norio. Thanks! Thanks, Anthony, for your great comments. You opinions matter a lot to me. My policy has always been not to be dogmatic about anything. Anything is possible in this mysterious world we’re living in!! 1. The T.O. listed on the front cover, “12D1-3-11-1”, doesn’t exist. If it was an actual technical order, it would be an operation manual for an airborne electronic system. A Methods and Procedures manual would start with “00-” (Ref. AFTO 00-5-18). T.O.’s are USAF technical orders. Also, numbering would go 1-1.1 a,b,c etc. til 2-1 and so on. 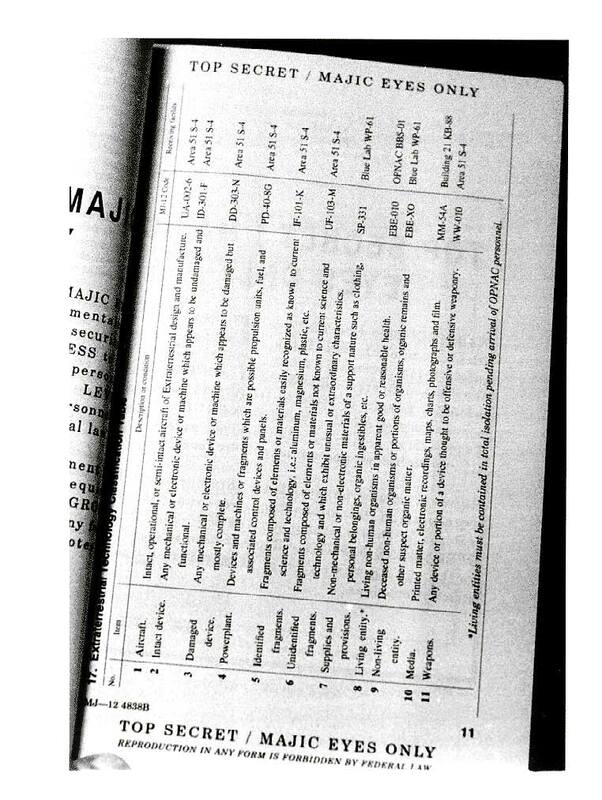 Pages not classified will be marked so on top and below. The cover page isn’t correct either. Having top secret and eyes only and the rest of the stuff after that wouldn’t be plastered on the front as it is. Restricted on top and then Top Secret further down the page is wrong. Highest classification is to be on top of page; Top Secret Restricted. from one EBE hybrid… keep an open mind with first a closed mouth. and keep studying. EBE 04/22/1954 p.s. I still suffer from hemoptysis (regular epistaxis / nosebleeds from my intracranial modifications. My family for 100’s of years. And my girlfriends get checked out. Some of my family even works in the system that investigates and reverse engineers. Every time I get an MRI, they have to be replaced. Usually within a month. I have one of them from a girlfriends back. Like a tiny chip of crystal with a hair antenna. Mine is on the pituitary gland.I had it removed once, The ex-naval EET specialist wouldn’t give it to me. The MRI shows the long term scaring. I heal “UNUSUALLY’ fast so I don’t bleed much. I don’t have any after birth modifications. What did yours look like? I have heard they have done some of some of these?. I creeped into groom lake manny years ago, I saw nothing. Later I was called to be on a portion of the public to go on a bus to Area 51 to validate it’s existence for a law suit by employees who were sick because of burning toxic substances. ( A taunt? and a laugh on me?) Then a tour of the DOE test range next door, that was cool too!. “A brief moment of openness the surgeon general called it. We could take and keep pictures. We were also allowed to ask questions! They answered most of them except for those silver disc questions, He said ooooh I’m sorry I can’t touch that one. We asked how they could tell us about all these top secret technologies and materials? He said laughing, no one would ever believe you! and He was right! Even those ancient alien guys wouldn’t talk to me? LOL! “It has to be aliens!” Some of these things are us! Later! Much later! Someone figured out time space intervals and string theory! Stephen Hawking didn’t know apparently, it’s too late! They have always been here and more show up regularly. We may be the last genetic hope for these fragile creatures. We hold great promise if they can keep us from killing each other, which I hear we almost did! Or do in about 5 years. 2/3 of us are gone! There is nothing “laid to rest” or proven as “fake” or disinfo by this. Actually, many prominent ufologists including Linda Moulton Howe think it is genuine and not disinfo at all. The type used was confirmed as done by the actual type machine used by the government in those days. The initials on the sign-out pages correlate to the names of real military officials who were stationed at or had access to Kirtland at the time. People who say “well TO’s aren’t right” and it’s “not numbered correctly” have missed the bigger picture that a completely HIGHER-TIERED hidden group of individuals was in charge of putting things like this together, so it may not correspond to exact specs of “normal” top secret docs. This is beyond top secret if you weren’t aware. Also how is it less credible because the donor asked to be anonymous? If your literal life/career/pension was on the line, would you risk it all just to satisfy the “skeptic debunkers”? I doubt it. Some have, but it should surprise no one that a document like this wouldn’t be tied to an official military source. Sorry to say, but this is a fake document. Also, let’s just break it down as simple as possible. Let’s say it is disinfo. Do you realize the amount of work that would go into producing this? What would that suggest about what they’re trying to hide or throw the scent off of, IF this document was disinfo? That’s a lot of work for something that’s a nothing. 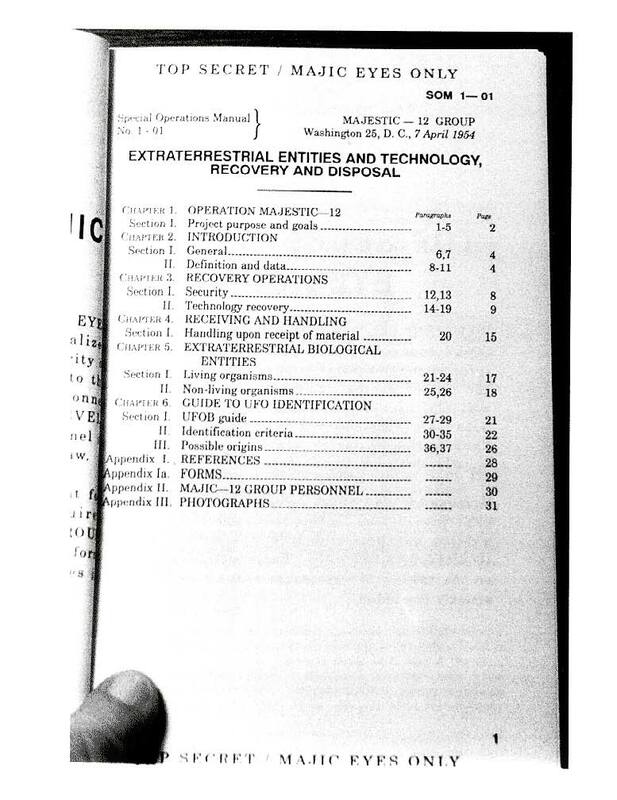 It makes more sense that it’s a real document to cover real scenarios that have been documented by some historians, of the literal dozens and dozens of UFO crash retrievals around the world (that the US is usually involved in). And my relative was part of those retrievals. If you want to read how one pretty much went? Read Saucer by Stephen Coonts. The beginning of the story is pretty damn close, except it was in the Mohave desert. in 10,000 year old limestone. And it still partially functioned. My relative reverse engineered the CCD video camera to replace his tube cameras on the Apollo missions after they would Burn in from the sun and or reflections. Trumped up research papers to give a guy who claimed the patent. I heard many very interesting stories with my relatives when they though I was too young to understand. Let’s pray we never actually get visited by EBEs. Chances are it will not end well for us. Just ask the Indians about life after Columbus. You said it right, Chris. That’s exactly what Stephen Hawking said. I just stumbled across this sight. I find it fascinating as well a incredibly refreshing that there is still a place on this, often overly offensive, online world where people share info, talk openly and respect other opinions. Thank you all for for showing that it’s ok to be open. I can not attest to the authenticity of this manual. I am quite used to government manuals having spent 22 years in the U.S. Marine Corps. 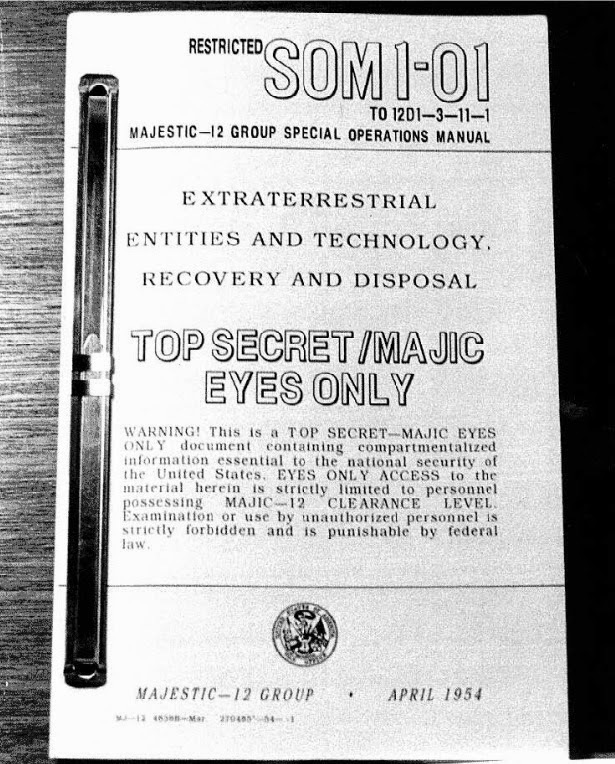 I still have no idea about the authenticity of this manual, Roswell, Cape Girardeau, etc.etc. But something is going on. Disinformation?? I don’t know. But there is no reason for ‘disinformation’ if you’re not trying to hide ‘information’ from the masses. This manual is a total BS. Promoted by Richard C. Doty.